A copy of the circulated flyer, which shows the OCCC Gateway program includes a free GED test. Click here to view a larger version of the flyer. Students who two days ago thought they would have to pay for a GED test initially promoted as free, found out today the original offer will be honored and the test will be given free of charge. 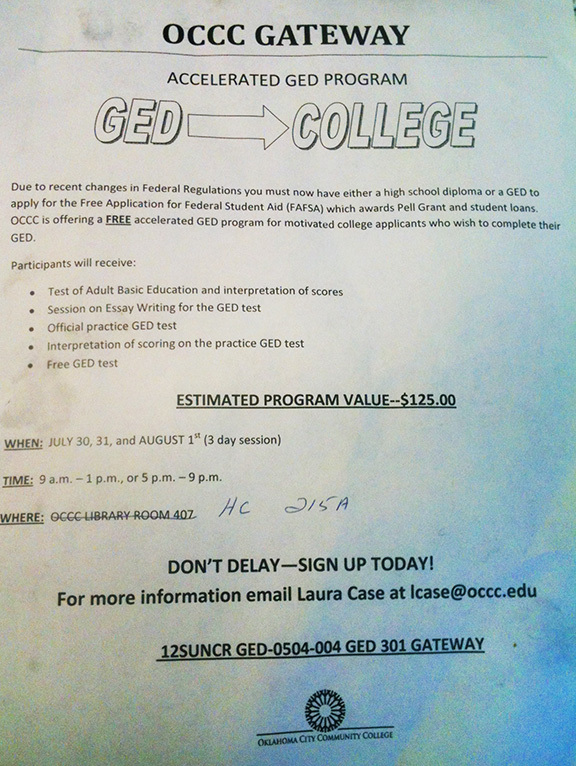 Although no one can agree as to where the confusion came from, one thing is certain: an OCCC employee made a flyer that promised a free GED test as part of the three-day OCCC Gateway program. But on the first day of classes, students were told there would be a charge for the test, causing several to walk out. Recruitment and Admissions Director Jon Horinek said the test was always meant to be free, but Community Outreach and Education Director Jessica Martinez-Brooks said that was never the case. During a meeting to discuss the Gateway program, she said, talk arose of a free practice GED test. Martinez-Brooks said she believes that may be where the confusion began. “We started working on this back in the summer when we found out financial aid was going to change,” Martinez-Brooks said. According to information obtained from the flyer, students now must have either a high school diploma or GED to apply for Pell Grants and student loans. “We don’t charge for the GED prep classes because they’re funded from the State Department of Education,” she said. But although Horinek said OCCC was going to “absorb” the costs of the tests, Martinez-Brooks said the program was not designed with that in mind. “We always charge $60 [for the tests,]” she said, although students enrolled in the preparatory program receive a $20 discount. Because of the incorrect flyer that was handed out to students, Martinez-Brooks said, students enrolled in the summer Gateway program will receive their tests for free as advertised. Horinek said students enrolled in the classes would be notified of the offer. In a story first published July 31, GED students Christina Yeager and Tanner Hodgins said several of their classmates left when Adult Basic Education Professor Pamela McGee announced the test would no longer be offered at no cost. Yeager said the sudden change made a big difference for several students in the class. It is unknown at this time if those who left will be able to re-take the class and take the GED test for free.